Tonight for our anniversary dinner at home, I made an Artichoke Cranberry Pasta Salad. It’s a salad I make often and it’s easy to modify. It’s enough for a meal by adding a little chicken. Tonight it was full of artichokes, tomatoes, black olives, dried blueberries and cranberries, sunflower seeds and toasted almonds plus rainbow pasta. I am linking with A Latte with Ott A for the Ocean Mist Farms artichoke recipe Iron Chef Challenge. 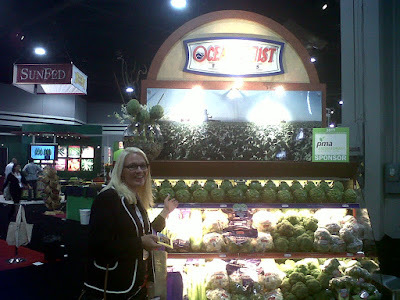 I was so excited for this challenge I took a picture at the Produce Marketing Association Fresh Summit show in Atlanta where I was for work in front of the Ocean Mist Farms booth. I work with the Know A California Farmer effort and Ocean Mist Farms are a California farm we should know more about I think. Visit them on Facebook. I am no former Artichoke Queen like Marilyn Monroe was. But I have been through Castroville, California, artichoke capitol of the world. I have seen artichokes fields and absolutely love eating artichokes which have been a treat ever since my sister discovered them decades ago. My mom would steam them for us and we ate fresh artichokes as a family and always on my sister’s birthday. There was something very special about California artichokes in our North Dakota kitchen. Unfortunately, this week I couldn’t find any fresh artichokes on the rural North Dakota prairie but I keep cans of artichokes in my pantry. I grabbed two cans of artichokes and drained them for the salad. You’ll find this salad easy to prepare and tasty. Boil 4 cups of dry pasta according to directions. Any type of noodle works but I usually use rotini. Cool noodles. In small bowl, mix 1/2 cup of mayonnaise, 1 TBSP honey, 2 tsp. season salt, 1 tsp. garlic powder and plenty of fresh cracked black pepper. Rough chop the artichokes. Slice black olives, enough for 1/2 cup. Add artichokes, sliced black olives and slice 2 cups of grape tomatoes and add to the cooled pasta. You can also add a few chopped green onions but I omitted tonight due to toddler eaters who do not like onions. I often add shredded carrots also. Then add either 1/2 cup of dried cranberries or 1/4 cup of dried blueberries and 1/4 cup of dried cranberries. Add 1/4 cup unsalted sunflower seeds and 1/4 cup toasted almonds. Stir all ingredients together and then I season a little more to taste. Use a blended salt mixture of your choice. Season salt works. Tonight I used a Fox Point Seasoning from Penzey’s. I added a little extra black pepper also. Chill the salad for at least 30-45 minutes before serving. But you can make this ahead of time and the flavors develop more and it’s fabulous. Tonight, we had this Artichoke Cranberry Pasta Salad alongside our steak anniversary dinner complete with french bread, sugar snap peas and twice baked potaotes. Tomorrow I’ll be eating leftover Artichoke Cranberry Pasta Salad for lunch and will enjoy it just as much or even more. I am linking up for the Iron Chef Artichoke Challenge. The winner is awarded a case of Ocean Mist Farms artichokes which I am very hopeful, crossing my fingers could arrive on the North Dakota prairie so I can have fresh artichokes to enjoy. I’ll invite my sister and mom over to enjoy with me just like old times. The only kind of artichoke I’ve eaten has been in dip, but that looks really good. I’m always putting cranberries on my salads so the addition of those makes it sound wonderful! So, when you steam an artichoke, do you add any seasonings before you eat it? I’ll have to try that. Huh, Marilyn Monroe and Artichokes…learn something new everyday! Hey! This looks very, very good to me and just might be on my Sunday afternoon menu. I always get mine out of a can, but I am going to have to get brave and buy the real deal! Looks like a great salad!